The hour-strike is a rare Fine Watchmaking complication, and rarer still when it is the product of a fully independent firm, based on an exclusive movement, and created ex nihilo – thus representing a markedly fresh approach. The advent of the Ultravox coincides with the 250th anniversary of Louis Moinet’s birth in Bourges in 1768. Throughout his entire life, the inventor of the Compteur de Tierces chronograph, which dates from 1816, made a large number of striking clocks, many of which adorned the drawing rooms of the world’s greatest leaders, from Napoleon Bonaparte to Tsar Alexander I and presidents of the United States (among them Thomas Jefferson and James Monroe), as well as many others besides. Ultravox forges a link between a heritage and the future; between Louis Moinet himself and the Ateliers that are now restoring his renown. Unlike many brands, the Ateliers still have a very large number of clocks made by their namesake, Louis Moinet, in perfect working order. Some of them are at the Ateliers’ premises in Saint-Blaise, Neuchâtel, while others are still in or near the corridors of power they originally graced, for instance at the White House and the Hermitage Museum. Watchmaker Eric Coudray, winner of the Gaïa Prize – and, in Jean-Marie Schaller’s words, “a magician!” – is one of the greatest watch designers alive. The Ultravox bears the name of this Master and his outstanding team, without whom nothing could be achieved. The Latin name “Ultravox”, the ‘strong voice’, is a nod both to the sound of the strike mechanism and to the neoclassical influences on Louis Moinet, whose clocks portrayed figures such as Minerva, Julius Caesar, and Cicero. Only twenty or so pieces will be made a year; indeed, no more could possibly be made, so complex is the piece. The strike mechanism denotes each passing hour on the hour, marking out the appropriate number of chimes. A silencer mechanism also allows the wearer to disengage the chime, if they so wish. 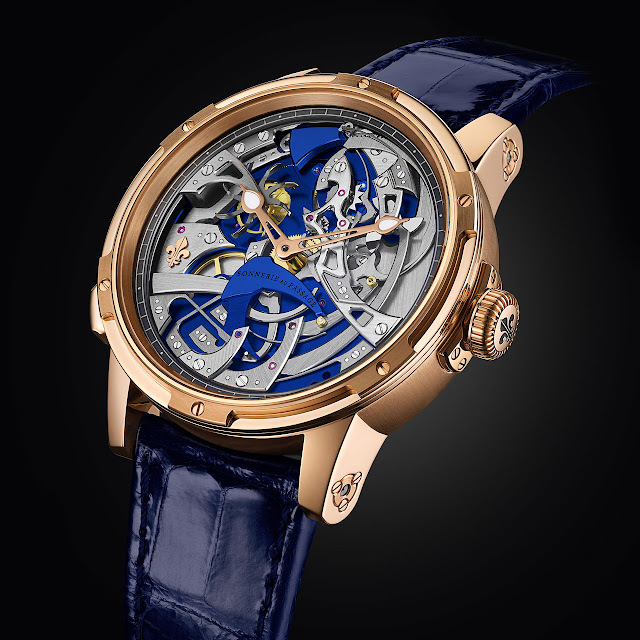 To enhance the excellence of this creation, for the first time Louis Moinet has unveiled its entire mechanism on the wrist. A special plate had to be designed, including over 50 jewels, to engage the chime mechanism’s various components, whose arrangement is extremely complex. The central flirt triggers a system arming the hammer at twelve o’clock, and strikes out the hours on a gong arrayed around the movement. The function of the fly, meanwhile, is to channel power from the barrel, regulating the rhythm of the chime. The Ultravox plate finish in “Moinet blue” is designed to reflect the light and offset the block polished and chamfered screws above it, showcasing the acoustic mechanism. The rear reveals a system with darkened, parallel double rotors. The first of these serves to generate force for the hours and minutes mechanism, while the second is wholly given over to the chime. With a diameter of 46.5 mm, the Ultravox will be available this autumn, in a first limited edition of just 28 rose gold timepieces.